They say there is a chemical in turkey that makes you sleepy. Now, it’s safe to say no scientific institution or study has actually proven this information. The truthiness of this bit of knowledge goes unquestioned because on every Thanksgiving day the fact is loudly announced by the obligatory young and obnoxious cousin/child of a neighbor/stranger’s nephew to a room full of people who are wiping gravy sweat from their brows. Often, it’s the last thing many people hear before drifting off into a tortured, caloric slumber. It is for this reason alone that Thanksgiving shouldn’t be celebrated at home. Since our fair collection of loud and populated street corners means this city never sleeps, we certainly can’t be sleeping on Nov. 25 ; we have things to do. Funkmaster Flex and Swizz Beatz will be at Webster Hall, and after that it’s straight to Union Square to stand in the line at Best Buy. If we sleep, someone will steal our spot. However, some East Village residents who actually admit to having a family – and maybe, god forbid, a life before their days of wearing a leather jacket – do get nostalgic for sweet potatoes and gizzards. Luckily, a few restaurants are providing prix fixe menus for gobblers of gravy and gratin. 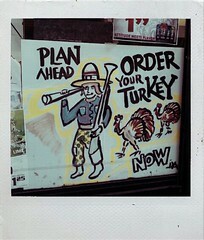 And, thank your holy fowls, it’s all the same delicious East Village food at the same reasonable prices.